When I have stations throughout the school year I enjoy adding a "fun station." I like to have it be somewhat literary or linguistic. 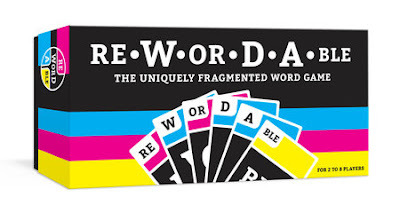 One great game is Bananagrams and I just found out about a new one called Rewordable. There are 124 cards consisting of single letters, blended sounds (ch), and full syllables (ine, age, etc). The game starts with three cards and three tokens facing up. Then each person gets five cards. You make words with your cards and collect tokens if possible. Once you create a word, others can add to it and it turns into THEIR word. It really is easy and we only looked at the directions twice the entire night! It isn't just the one with the most verbose vocabulary that wins. It takes some serious thinking and brain power to keep it. Notes: If you are using this as a quickie with your students, I would not use the tokens. I would just have each student grab five cards and see what they can create.